Xbox One uses the Kinect to control your home cinema equipment through infrared (IR) signals, the same technology used in remote controls. If you’re having trouble controlling your home cinema from Xbox One, and all other troubleshooting has failed, you can use an IR extension cable to control your home cinema. An IR extension cable can help deliver the infrared signal directly to your devices, even when they’re closed away in cabinets. Watch the video Use an IR extension cable to control home cinema equipment. Note The video is available in English only. Do I need an IR extension cable? You do not have a Kinect sensor plugged in. Your devices are in a cabinet or otherwise obstructed. Even glass cabinet doors can block an IR signal. Your room has significant direct sunlight on your home cinema equipment. What is an IR extension cable and what does it do? An IR extension cable is a thin cable with an IR emitter(s) on the end. It allows you to emit IR signals to a location that the Kinect can’t reach. 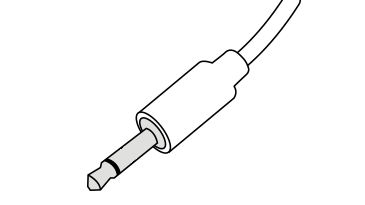 You can position an emitter in otherwise difficult-to-access spaces and work around things like media cabinets, decorations and so on. What kind of IR extension cable can I use with Xbox One? It connects using a 3.5mm jack (similar to a pair of standard headphones). It has three or fewer emitters. It is an IR transmitter, not a receiver. The 3.5 mm jack has only two conductors like the image below. How do I install an IR extension cable? 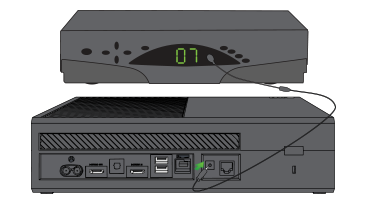 Connect your IR extension cable to the IR port on the back of the Xbox One. Position the emitters near the devices that you want to control. These may be designed to fit under the device near the IR window, or they may be sticky and adhere directly to the IR window. Test to make sure that you can control the device. Reposition the emitters if necessary. Would you like to contact Support regarding the "Using IR extension cables with Xbox One" issue you were reading about or a different issue?